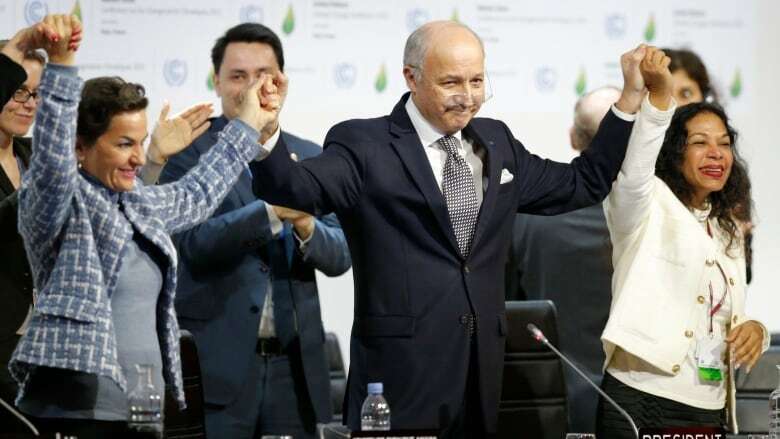 COP21 gave the world targets, promises, deadlines and questions. Green Party Leader Elizabeth May and Naomi Klein, author of "This Changes Everything" sort through the good, the bad and what's missing in the Paris Climate Change Agreement. Canada's Environment Minister Catherine McKenna is not the only one feeling that way about Saturday's Paris Agreement to combat climate change. German Chancellor Angela Merkel says the deal signals a "historic turning point in climate policy." U.S. President Barack Obama called it "the best chance we have to save the one planet that we've got." Under the Paris Agreement, the governments of 195 countries have committed to keep the earth's temperature from rising more than two degrees Celsius above pre-industrial levels -- which scientists say is necessary to avoid catastrophic climate change. Individual countries will establish their own, non-binding targets for reducing greenhouse gas emissions, with the expectation that those targets will be reviewed and amped up over time. And developed countries will be expected to spend at least $100-Billion-a-year between 2020 and 2025 to help emerging economies deal with the effects of climate change. And yet ... not everyone believes this will be enough. In fact some climate activists say the Paris Agreement falls far short of what's needed to save the planet. Naomi Klein is an award-winning journalist and the author of "This Changes Everything: Capitalism vs the Climate." She was in London, England. Elizabeth May is the Leader of the Green Party of Canada and the MP for Saanich-Gulf Islands. She was in Paris. Are you optimistic about what the Paris agreement will mean for planet earth? Tweet us @TheCurrentCBC. Find us on Facebook or as always send us an email.